3 leaves of textual records ; 10 x 18 cm. 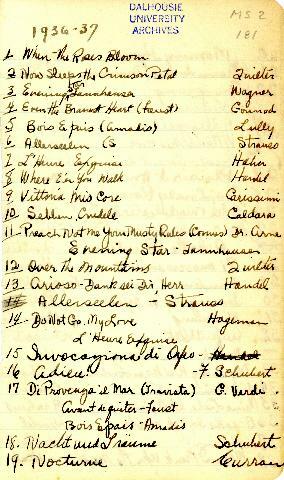 Item consists of a handwritten 41-entry list of short musical pieces compiled by David Murray, with the composer of each piece noted in the right-hand margin. The first 23 entries on the list are under the heading 1936-37, the following 18 entries are under the heading 1937-38, while the final unnumbered entry is under the heading Halifax--Jan. 39. One page of item contains 20 examples of humorous quotations written by Murray, possibly for use in future sketches. While unrelated to the musical list, the pages appear to have been removed sequentially from a notebook. Description revised on March 1, 2018.